Create festive, personalized photo Christmas ornaments using your favorite pictures, wood blocks and Mod Podge. 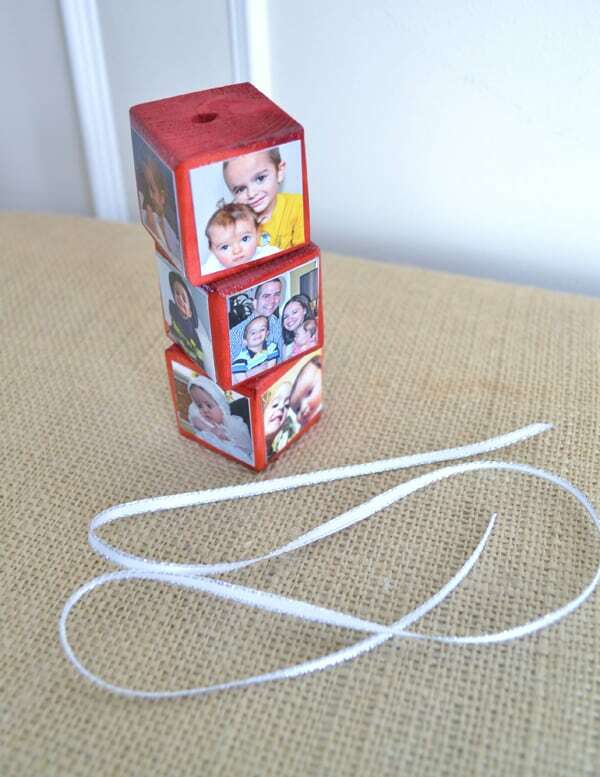 These DIY photo ornaments make great gifts! Hello there, fellow Mod Podgers! 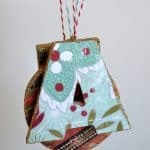 It's Linda here, from burlap+blue, with a festive and fun personalized photo Christmas ornaments tutorial to share with you all today. It's hard to believe the holidays are upon us, and these will make a GREAT gift for the loved ones in your life (I should know . . . I've already made four of these cuties to give away)! 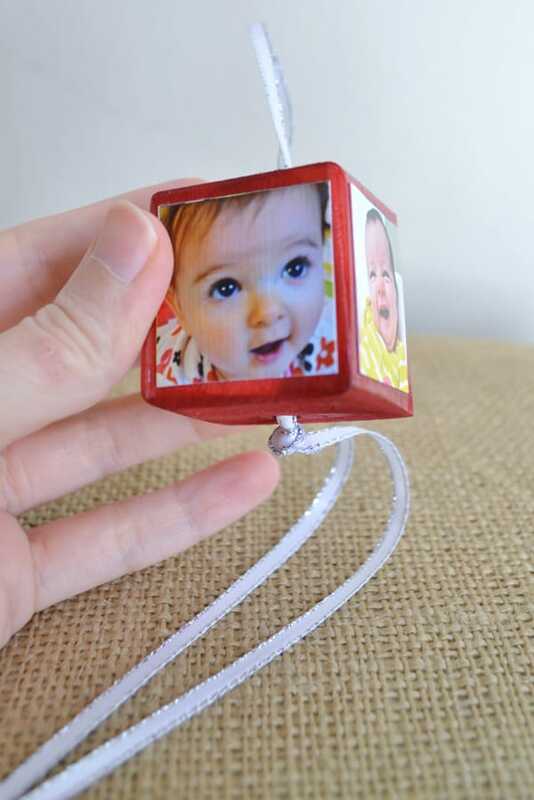 Here's how you make a bunch of these fantastic photo ornaments. Step 1: First, you'll need to resize and print out the images you want to use on your blocks. 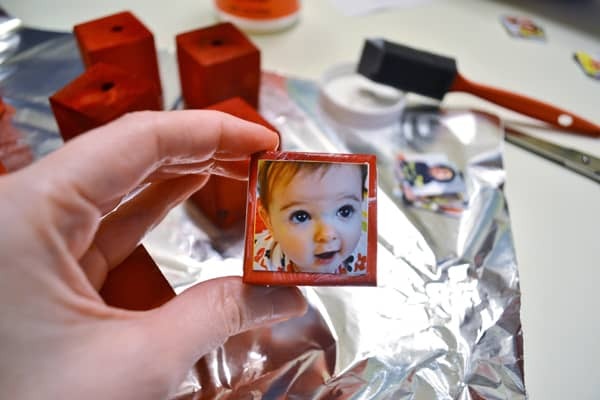 The blocks that I used are 1.5″ cube, so I shrunk my photos down to 1.25″. 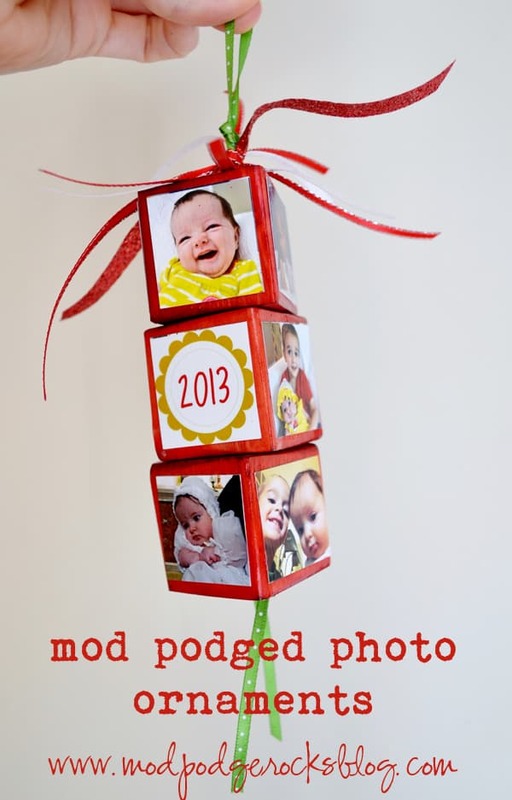 I used four photos per block, and used three blocks per ornament for a total of 12 pictures per ornament. Don't forget to also create a square for the date! 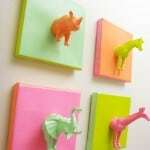 If you're unable to make the blocks yourself, you can easily find them online (here's a link to some I found on Amazon). FYI-I used Photoshop Elements to resize my images, but any photo editor should work (PicMonkey is free). Step 2: If desired, use Rit dye to dye your blocks. Here's a tutorial I did last year on dyeing clothespins – just use the same technique for dyeing your blocks. 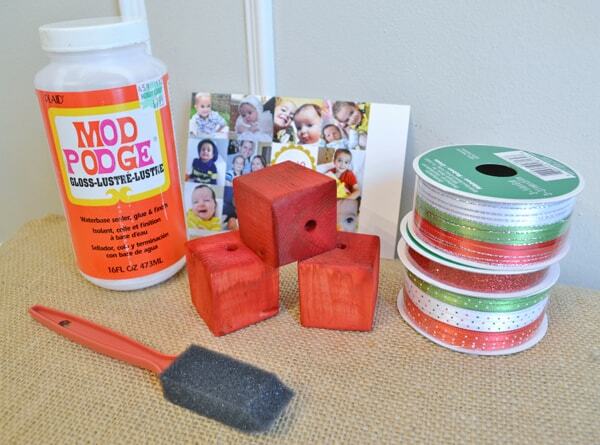 Step 3: Using scissors, cut our your images, and Mod Podge them onto the four sides of your blocks. Step 4: Let dry. 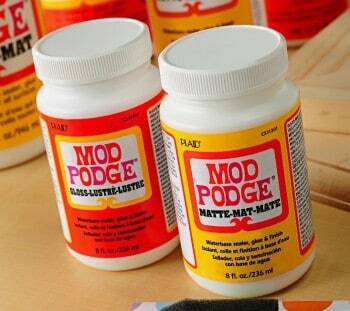 Apply three coats of Mod Podge to seal, allowing your blocks to dry well in between coats. Almost done! Now we're ready to add the ribbon. 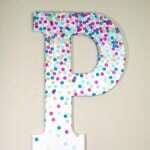 I used a length of ribbon that was 25″ long, you may need a different length depending on the size of your blocks. Step 5: Fold your ribbon in half, and tie a knot at the top of your ribbon. This is how your ornament will hang from your tree (or wherever your recipient decides to display it). Step 6: Take the loose ends of your ribbon, and string all three blocks onto it. You can tie a knot between each block (like the photo below), or skip it. I think it looks fine either way! Once done, tie a knot at the bottom of the ribbon to hold the blocks on. 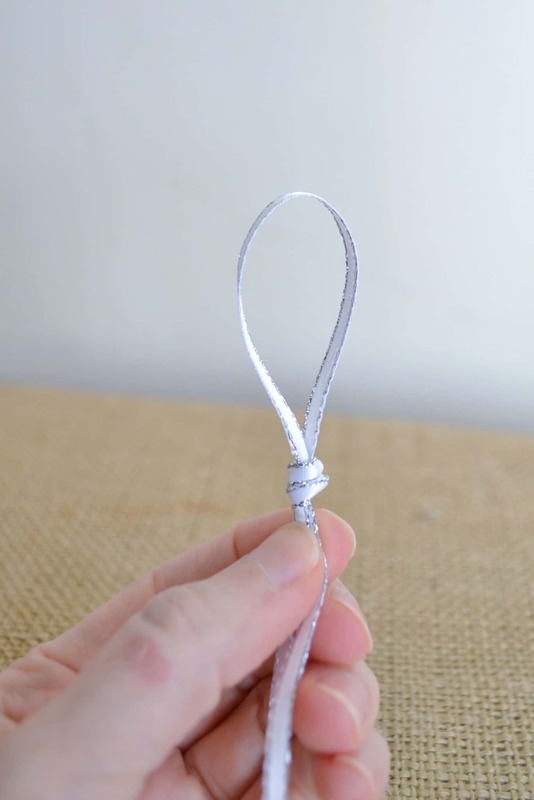 Lastly, take lengths of ribbon and tie to the loop end of the ribbon to decorate it! Thank you so much for letting me share my photo Christmas ornaments with you all today! 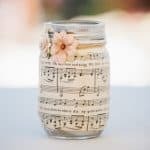 You can find lots of other tutorials and inspiration on my blog! Love it!!! 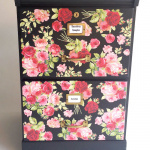 Pinning and doing!